Females have a hard and dark (sclerotized) ovipositor with prominent serrations or saw-teeth that enable the fly to lay eggs in intact ripening fruit. Antennae with branched bristle-like part called arista. Males have a distinctive dark spot at the tip of each wing. Males also have two dark bands (combs) of 3-6 teeth on each front leg. Sclerotized ovipositor of SWD (right) compared to the normal ovipositor of a vinegar fly (left). 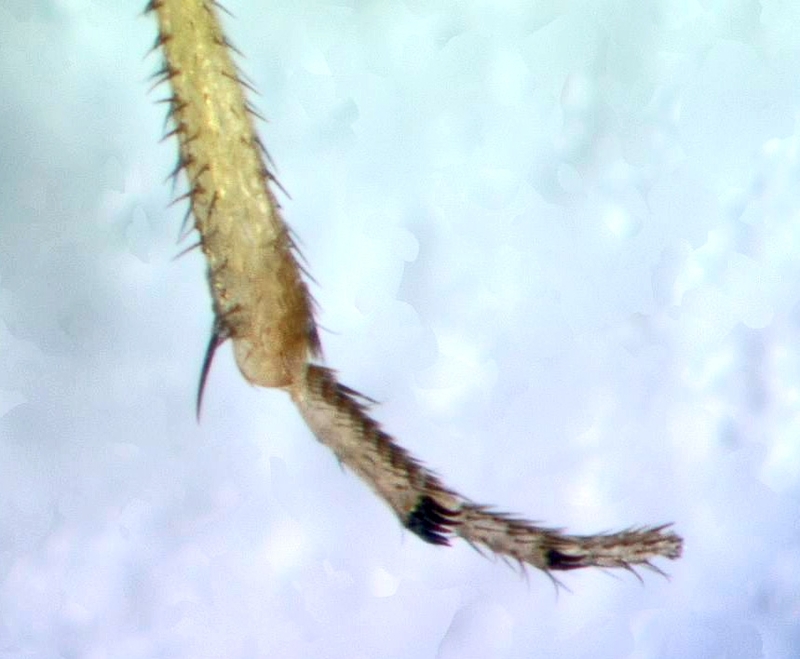 Distinctive combs on the front legs of male spotted wing drosophila. Photo by Gevork Arakelian. Origin and distribution: It is traditionally known to be a pest in Asia, but it is now reported in Neotropics, North America, and Europe. In the US, it has been reported in Hawaii, Washington, Oregon, California, Utah, Minnesota, Michigan, Missouri, Louisiana, West Virginia, Pennsylvania, North Carolina, South Carolina, and Florida. Host range: They generally infest thin-skinned fruit and prefer temperate climate. Host range includes apple, blackberry, blueberry, cherry, dogwood, grape, mulberry, peach, persimmons, plum, raspberry, and strawberry. Non-crop hosts that support SWD populations include barberry, brambles (wild raspberry and blackberry), buckthorn, cotoneaster, currant, dogwood, elderberry, fig, honeysuckle, laurel, mulberry, nightshade, oleaster, orange jasmine, pin cherry, pokeweed, purple flowering raspberry, spicebush, sweet box, and yew. Biology: SWD prefer 68-86 oF and overwinter as adults. Various sources suggested 5-10 generations per year. Eggs are translucent to milky-white. Females lay an average of 384 eggs at 7-16 per day and there can be 1-3 eggs per oviposition site. Multiple females may deposit eggs in the same fruit. Eggs hatch in 2-72 hours and larval stage lasts for 3-13 days. Larvae milky-white with a legless body tapering towards the anterior end (towards the head). Mouthparts are dark and sclerotized. Pupation takes place inside the fruit or in the soil and lasts for 3-15 days. Pupae are reddish brown and have two spiracles (breathing tubes) at the anterior end. Adults are small (2-3 mm) flies. Life cycle takes anywhere from 21-25 days at 59 oF to 7 days at 82 oF. Females can start laying eggs within 1 day after their emergence and can lay more than 400 eggs in their lifetime. Based on the degree day (DD) calculations, egg, larval, and pupal stages require 20.3, 118.1, and 200 DD. 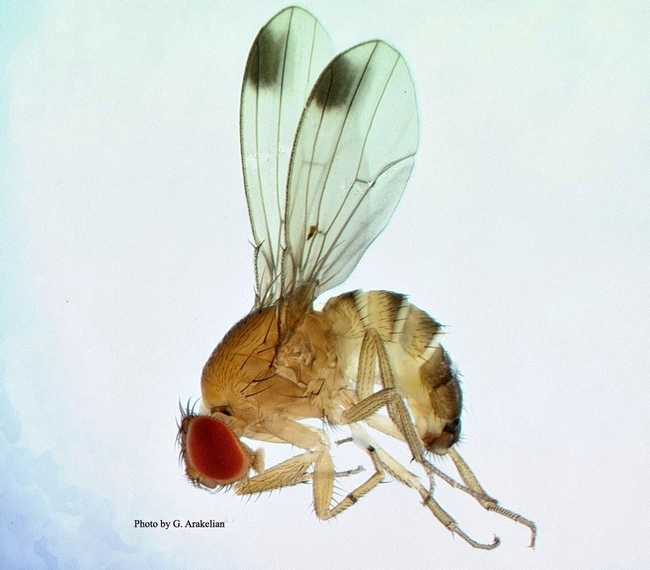 Damage: Other fruit flies usually infest overripe and fallen fruit, but SWD infests fresh fruit because of its powerful ovipositor. Adults feed on fallen fruit but lay their eggs under the skin of intact fruit. Softening and collapse of the tissue results from larval feeding inside the fruit. Oviposition holes can be seen on the fruit with close observation. In addition to the direct damage, SWD makes the infested fruit vulnerable to other pests and diseases. Monitoring SWD is very important to avoid harvesting and marketing infested berries. Monitoring: Use traps made with apple cider vinegar or yeast-sugar solutions for early detection of SWD. There are numerous studies using a variety of containers and attractants. Pherocon traps and lures are commercially available for SWD monitoring. Management: A variety of organic and conventional management options are available. Cultural – Discard fallen and unmarketable fruit in the field to prevent infestation. Remove wild hosts in the vicinity that might harbor SWD populations. Botanical – Pyrethrins and azadirachtin products are used in multiple studies. Chemical – Research indicates that organophosphates, pyrethroids, and spinosyns are among the chemicals that can be used against SWD. Remember to rotate chemicals among different mode of action groups to reduce the risk of resistance development. Microbial – Entomopathogenic fungi (Beauveria bassiana or Isaria fumosorosea) and bacteria-based products such as Grandevo (Chromobacterium subtsugae) and Venerate (Burkholderia rinojensis) against adults, and entomopathogenic nematodes (Heterorhabditis spp. and Steinernema spp.) against pupae that form outside the fruit can be used. Hey boss, can you fill us in a bit more on the pherocon deal for this fly? I haven't tried it, but if it is more efficacious on trapping than yeast sugar water or apple cider vinegar, I'd be very interested in knowing that. I haven't tested the recent one, but an earlier version worked well. Apple cider vinegar and yeast-sugar solution also work, but there are several reports with conflicting results on which one is more attractive. Type of the trap could also contribute to this variation. Ok thanks Surendra. Not to get deeper into the weeds than need be, but we found in work with Hamby, Sheehan and Zalom that the apple cider vinegar worked better than yeast sugar water in the winter, while the converse was true in the summer. Definitely agree that trap type is going to contribute to the variation, so we'd have to control for that in a study. If you do happen into those pherocon deals, maybe send some up to me for a side by side with our traditional trapping media. Thanks for putting this out - I read your blogs pretty closely. Yes, Mark! It all depends on the crops, attractant mixes, traps and so on. That is why I did not make specific recommendations, but provided available options. Thank you for asking these questions as it will add clarity. I just read about a new lure formulation for SWD. You might be interested to see. Thanks Surendra for the lead on the lure. Good article, but I'd like to see their reformulated trap solution tested against what we are currently using. Since they realized better results over their previous solution by raising the amount (among other things) of acetic acid that has me wondering if it would be able to best our "apple cider vinegar" solution, which after all is really, really high in acetic acid. Let me know if you get some of these trap solutions, I'd like to try them out. Thanks Surendra, this is a good article. The only comment I would have is that wine is actually a tricky ingredient to work with because of the rather puritanical regulations concerning its transport in the USA - ie "open container laws". Since mixing generally takes place back at the ranch, one would be careful on where this is carried, not to mention could not have minors work with it. This reminds me of when we had an employee handling large amounts of "port wine" for live trapping of LBAM. He was using cases and cases of the stuff, and would dutifully deposit all the bottles in the recycling bin at the county yard. Well, that caused a bit of a stir, since people were thinking that all this stuff was being consumed every day by our guy out there by the shed. We ended up having some explaining to do. Ethyl alcohol as an ingredient seems to always have ancillary issues with it! At any rate, it's good to know that there is a better trap to be had for SWD. Thanks for thinking of me.